The fine Plaza Mayor, with its plethora of bars, sandstone faces and ivy filigree, teemed with life - Basques and tourists alike flooding the terraces and enjoying the warmth. The Nervión, with its green reflective waters, took the waving image of the newer city expansion round to the folded shimmering madness of the Guggenheim. Stall-sellers with heaving plates of gildas - toothpick skewers of olives, sweet chillies and anchovies - jams, honeys and sweet pollen provided an interesting shift for the visitor out of the old and into the moneyed new. Bilbao was a classy and elegant mix of aged and cutting edge, industrial and artistic, modernist and classical. The road slowly north crept out of the city and arrived thirty minutes later at the unassuming and uninteresting resort village of Bakio. 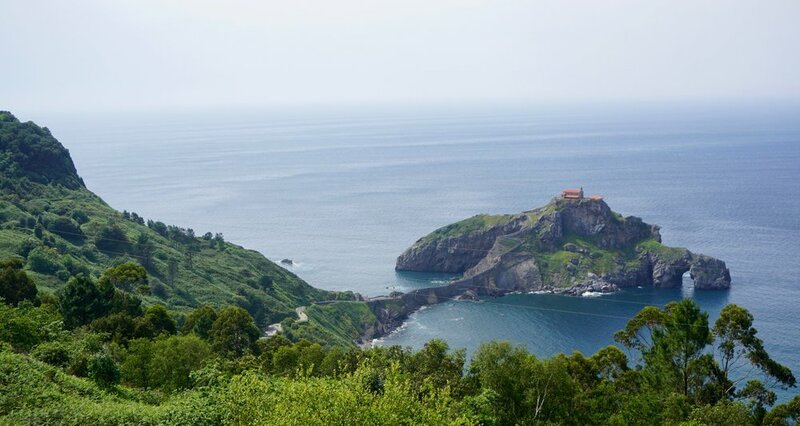 There was a cluster of bars on the west side of the sandy beach where we took sandwiches and salads and txacoli wines, before quickly leaving the place and hugging the northern headlands to catch a glimpse of the absurd TV-beloved beauty of San Juan de Gaztelugatxe; an islet where a narrow zig-zagging walkway pings back and forth uphill to a 10th century chapel. Charm then drowned the area as woodlands and hillocks and winding country lanes led to cutesy Mundaka. 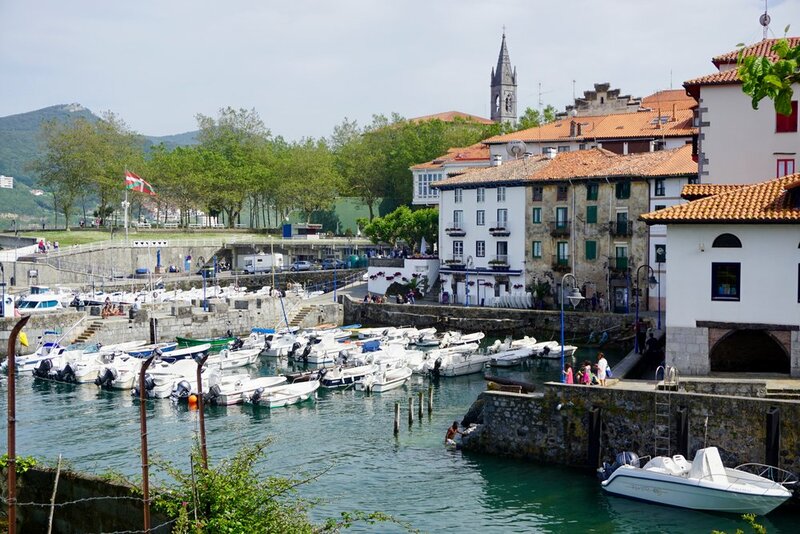 It was a buzzing little fishing town full of those blocky houses so redolent of the Basque Country: white paint, stone indents, Juliet balconies, coloured window frames, orange tiled roofs. There was life to the village. A little harbourette was full of two-person motorboats, teenagers were mucking about - flirting with each other and jumping into the water - the adults sat on the piers drinking on plastic chairs, whilst flowerpots and Basque flags added texture to a scene that was more energetic that presumed from a place of such diminutive size. A man in a French blue and white striped t-shirt bobbed past in a little orange plastic boat, smoking with one hand and piloting with an oar in the other. We left and spent a quick while in the bulkier and finer Lekeitio. The village starts with a wide harbour - multicoloured, shining with glassy galerias and orange tiles - which was full to bursting with small pleasure boats. 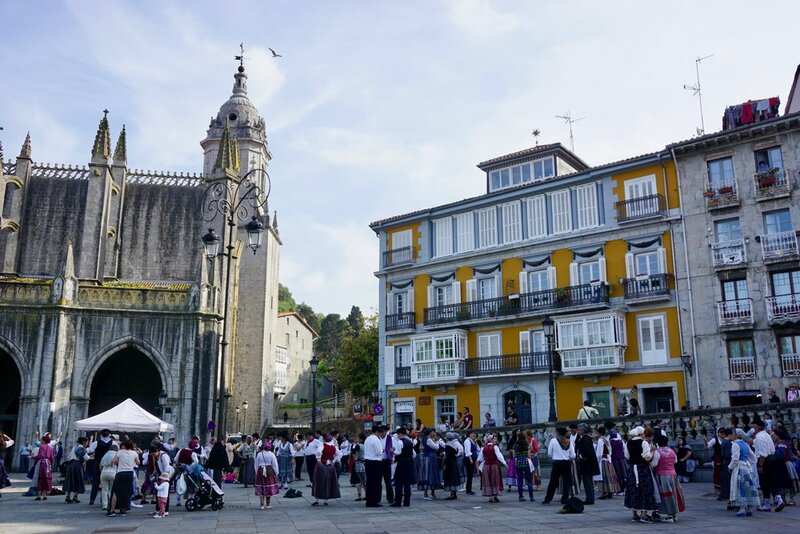 In the main square a fat and mossy gothic church loomed over people in local dress: pinafores, tartanesque long skirts called gonas and headscarves called zapis collecting their hair together. They danced, half-skipping in and out to music. The men wore berets called txapelas, scarves around their necks, white shirts and black trousers. The village crumpled steeply uphill with the air of a classic fisherman hideout. Tight lanes, tiny bars, clothes hanging out to dry on lines, more balconies and pot plants. The light was on the turn and the roads were slow in the Basque countryside. The decision was made to head south from the waters back to more connected civilisation.